To celebrate the holidays, I got together with some friends from business school for a great dinner over at the Chubb’s apartment. Zach and Laura have the best kitchen and a great convection oven which I love using. This dish is super easy but really impressive. Put all ingredients into a blender or food processor. Turn it on and chop until it creates a cohesive sauce. Taste the sauce and adjust the salt, sugar, chili and vinegar till it tastes good. Place the roast into a large metal bowl. Sprinkle it generously with lots of sea salt on all sides and some pepper. 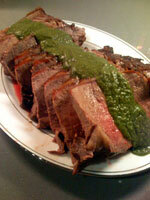 Rub in olive oil and a few tablespoons of the sauce. Cover the bowl with plastic wrap and marinate in the refrigerator overnight. Preheat the over to 475 degrees. 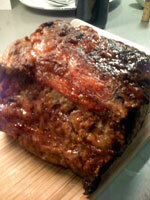 Place the roast onto a rack in a large roasting pan, fat side up. Insert a probe thermometer into the roast so that it reaches the middle. 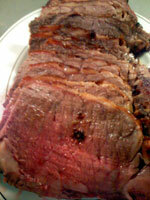 Roast the beef in the oven for 15 minutes at 475. You should hear the fat cooking and the top will start to brown. 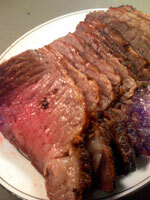 Reduce the temperature to 350 and cook the roast until the probe thermometer tells you that it has reach rare. Remove the roast from the oven and let it rest for 15 minutes, covered in foil, to lock in the juices. Heat the sauce in a small saucepan on medium low until it is warm and the sharp taste of raw onions is gone. Slice the roast against the grain and serve with the sauce.